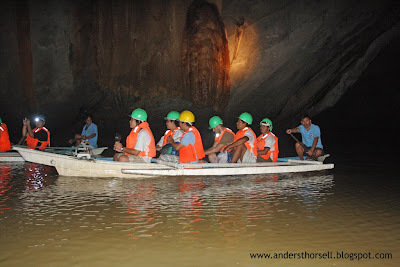 The Puerto Princesa Subterranean River National Park is located about 50 kilometers north of the city of Puerto Princesa, Palawan, Philippines. The National Park is located in the Saint Paul Mountain Range on the northern coast of the island. It is bordered by St. Paul Bay to the north and the Babuyan River to the east. The City Government of Puerto Princesa has managed the National Park since 1992. It is also known as St. Paul's Subterranean River National Park, or St. Paul Underground River. The entrance to the Subterranean River is a short hike from the town of Sabang. Puerto Princesa Subterranean River National Park is one of the 28 finalists for the "New Seven Wonders of Nature" competition. The park has a limestone karst mountain landscape with an 8.2 kilometer navigable underground river. A distinguishing feature of the river is that it winds through a cave before flowing directly into the South China Sea. It includes major formations of stalactites and stalagmites, and several large chambers. The lower portion of the river is subject to tidal influences. Until the 2007 discovery of an underground river in Mexico's Yucatan Peninsula, the Puerto Princesa Subterranean River was reputed to be the world's longest underground river.